Home Diseases Is viral bronchitis contagious? One of the most common ailments, especially among children and frail adults, is acute viral bronchitis. In most people myriads of germs lurk in the nose and throat, ready to find their way into the air passages and cause trouble there. In many cases acute viral bronchitis develops as a complication of the common cold. In children, enlarged adenoids and diseased tonsils may have much to do with the tendency to repeated attacks of acute viral bronchitis. In some adults there appears to be a peculiar lack of resistance to this condition. In others, allergy plays an important causative role. Exposure to cold from improper clothing may be conducive to bronchitis. Along with the chilling there is a lowering of resistance, and the alert germs take advantage of the opportunity to overcome the existing natural resistance. Bronchitis is a common complication of measles, scarlet fever, whooping cough, influenza, typhoid fever, and other infections. Chlorine and some other gases or fumes accidentally encountered in chemical laboratories or manufacturing establishments can produce severe forms of acute viral bronchitis. The early symptoms of a typical case of acute viral bronchitis are mild fever, mild headache, chilliness, some hoarseness and wheezing, a persistent but at first unproductive cough, and a "raw" sensation behind the breast bone. When the cough becomes productive, the feeling of distress behind the breastbone usually lessens or subsides. Ordinarily, acute viral bronchitis runs its course in a few days, but it may become persistent, lingering on for months and finally becoming chronic viral bronchitis. 1. If a fever is present, broncho-pneumonia must be suspected and medical attention should be provided. 2. As long as there is any fever, keep the patient in bed in a moderately warm room, and keep the temperature in the room as nearly constant as possible. 3. If the patient is a smoker, his smoking should be discontinued. give steam inhalations thrice daily. 5. Give the patient hot fomentations to the chest twice a day, and apply a moist chest pack to the upper chest overnight, taking care not to let him become chilled at any time. also, and continue the treatment long enough to produce free perspiration. Be especially careful not to allow any chilling of the patient as long as he is perspiring. remedy and to use some antibiotics to combat infection. irritating or corrosive gases or fumes, it is especially important to give the patient the benefit of a physician's care. Chronic viral bronchitis may develop after one or more attacks of acute viral bronchitis, but many cases that are thought to be chronic viral bronchitis may be something more serious, such as pulmonary emphysema, tuberculosis, or bronchiogel1ic carcinoma (in adults). It may complicate or follow any disease or condition which involves protracted or repeated irritation or inflammation of the lining of the bronchial tubes. In a report of the United States Surgeon General's Advisory Committee, which had been given the assignment of studying the relationship between smoking and health, it was stated that cigarette smoking is the most important of the causes of chronic viral bronchitis in the United States, and increases the risk of dying from chronic viral bronchitis. A dry cough, worse in the mornings, is characteristic. The cough is more severe and more likely to bring up sputum in the wintertime and following a cold. Wheezing and difficulty of breathing eventually develop in many cases. Fever is rare. 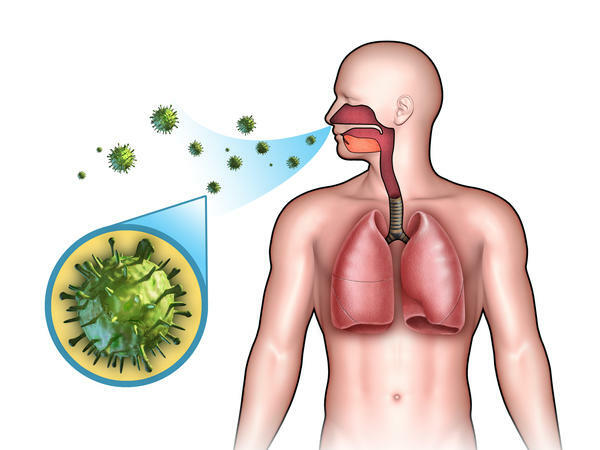 The condition may become worse from year to year, but since the discovery of antibiotics it has proved possible to bring about improvement in many cases of chronic viral bronchitis in which secondary viral infection is a factor. 1. Apply to a physician or to your local health department for an examination to determine whether or not what seems to be chronic viral bronchitis is really a more serious disease. Especially is this advice applicable to older people. 4. Correct the diet. Do not eat meat, fried food, greasy food, highly seasoned food, pastry, desserts, sweets, confections, or much starch. The diet should consist largely of fruits and vegetables. 6. Use steam inhalations once a day. 7. Hot and cold foot baths, fomentations to the chest followed.